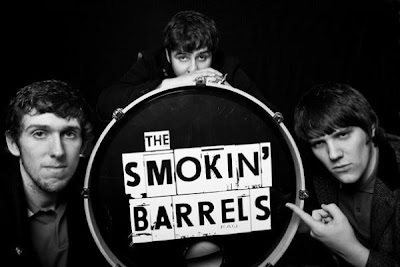 The Smokin' Barrels are a young band out of Newcastle, and have some big Rock n Roll sounds to share with the world. They currently have a 5 song EP out, titled 'Lies, Ties and Compromise', and another EP titled 'Mindless Self Indulgence' which should be on sale shortly. After taking a few listens to their music, you get the feeling there is a heavy Kasabian and Oasis resemblance. The thing that stands out to me most about what The Smokin' Barrels in what they have to offer, is their pure excitement and energy that they bring with their music. When they are playing they play hard and put everything they have into their music. The guitars and drums rarely take a break and the crisp vocals only fuel the bands raw energy. After only a few months of playing gigs, The Smokin' Barrels have already performed at 02 Academy, Newcastle, for over 1000 people, an honor which is usually reserved for more well established and proven acts. They also were put on as a supporting act for Kasabian this past December, which fit them just beautifully. My suggestion, while listening to The Smokin' Barrels is just to sit back and enjoy the ride, and take a listen to 'Stella In The Starlight' from their EP, it is a very nice introduction to the band and shows the type of potential that awaits them. The band says it best "Our Music Is Our Own, Enjoy!"